My Very Small Business has a Sale, too. As the post-Thanksgiving weekend continues here in the US, I thought I’d pop in and let you know that I’ve clambered onto the band-wagon! Oh yes, I’ve clambered! Because there’s just nothing better than a bandwagon to get things going! Today is what retailers have been calling lately “Small Business Saturday” – when you’re encouraged to patronize small locally owned businesses to do your holiday shopping. While I generally see most name-dubbing of specific days as marketing ploys, the whole “go forth and support small businesses” is a strategy that’s totally worthwhile. When it comes to the needlework industry, it’s especially important! If we want to continue having access to fine needlework supplies, it’s essential to support small needlework businesses. 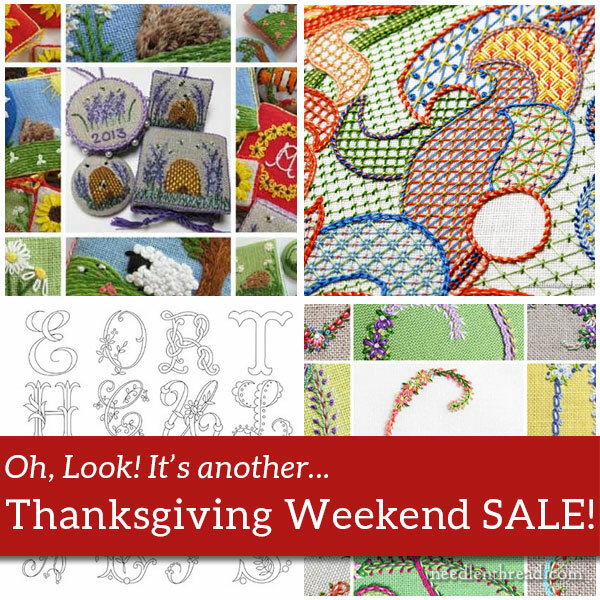 If you take time this weekend to meander through your favorite needlework shops – either in person (if you have one) or online – I bet you’ll find some good sales! Some of my advertisers here on Needle ‘n Thread have sales going, too, so check them out while you’re browsing about online. From free shipping deals to discounts, you never know what treasures you’ll find. And, as a bonus, you’ll have that deep-down-warm-fuzzy feeling of having helped out a small business. And speaking of helping small businesses, I’m going to shamelessly plug my own. Last year, I explained (in this article) why I finally capitulated to the marketing ploys that encourage us to spend our hard-earned cash on “small business Saturday” and “Cyber Monday.” The reasons haven’t changed! And so, here you find me offering yet another post-Thanksgiving sale. If you’ve been hankering for any of my e-books, they’re 15% off today through midnight on Monday. You’re most welcome to pop on over to my shop to see if any of them strike your fancy! Next year, I’ll have a bit more to offer, if all goes as planned. It’s been a rather lean year this year, but productivity is picking up, and you’ll see the fruits in 2017. In the meantime, if you’re looking for instructions to help you make Christmas ornaments, consider Lavender Honey & Other Little Things – there are all kinds of finishing instructions in there that would suit ornament-making. Maybe you want to monogram some gifts this year? Favorite Monograms is chockfull of different alphabet designs, and Stitch Sampler Alphabet will help you embroider some really fun, colorful letters. Perhaps you want to stitch something for your church? You’ll find over 120 patterns in my Church Patterns collection. And the Marian Medallion Project is a comprehensive way to follow along with a major silk and goldwork project, to learn techniques and tips. Or maybe you just want to stitch for the fun of it? I have some thorough stitch printables available, and the Lattice Jumble Sampler Guide is a totally random, relaxing, fun project, too. And there you have it! You can get any or all for 15% off until Monday night. Soooo… go forth and shop right here on Needle ‘n Thread! And I’ll see you on Monday, with stitching progress, corrections, the weirdest surprise, and new ideas. I am having so much fun staying home and buying “stitching” stuff over this Thanksgiving/Black Friday/Small Business Saturday weekend! I bought 3 patterns from Trish Burr yesterday and your book on monograms today! Now, all I have to do is find myself some time to stitch everything…instead of sitting in front of my pc buying stuff!! “The weirdest surprise”….. hmmm… you gave birth to a baby kaleidoscope, already finished? You adopted an abused echidna? You ARE an echidna? You found an echidna at a gas station and it told you the meaning of life, then asked if you could break a twenty? I can’t get away from this echidna thing. I picked up one this morning. Now I’m back and trying to decide if I want/need another. Well, maybe I’ll make something. Or not. You know your record on these things. But Mary does so much for us and gives us so much free. Shouldn’t I support her? Am very, very impressed with all the tips and techniques in there. A worthwhile purchase. I had more or less the same internal conversation when I bought Mary’s Stitch Sampler Alphabet, and I’m very glad I did buy it. I may not have gotten round to stitching flowery monograms, but the stitch dictionary alone has given me a ton of ideas. I’m also a huge fan of the bunny rabbit! If there isn’t a rabbit (or portion thereof) in a piece I do, I at least have to add another critter of some kind. Have to tell you, I purchased Lavender Honey right away when it came out for the sole purpose of the rabbit! Keep the fun in your work! Previous Previous post: A Stitcher’s Christmas Give-Away #1: Thread!